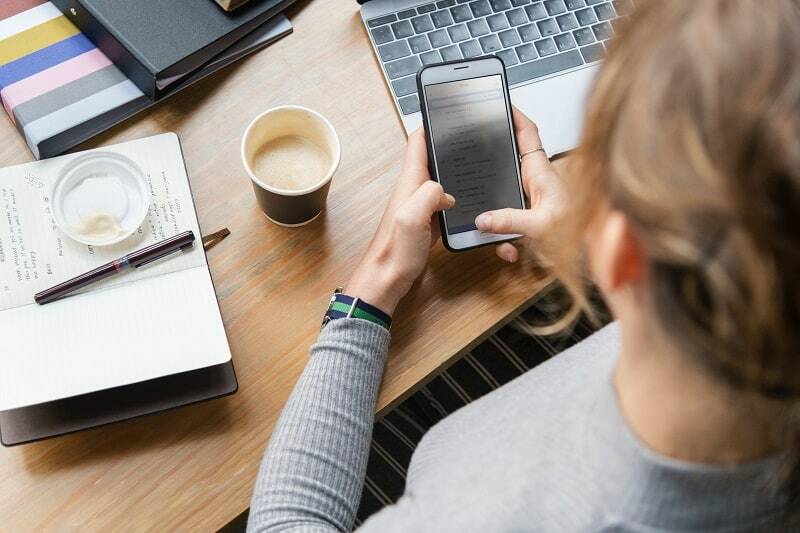 If there’s one thing that’s become very clear in recent times, it is that email marketing remains a crucial way to talk to your audience. Social media is very important, I’m a big fan of Pinterest to drive traffic and you can always find new ways to reach people. But the core of your communication strategy should always be email marketing. 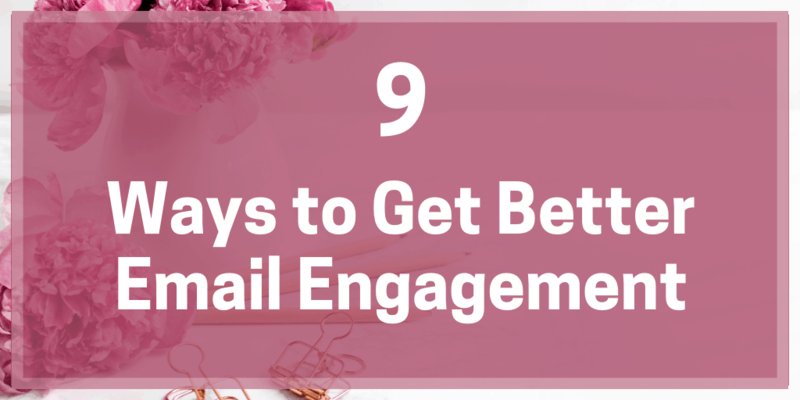 And one of the top metrics to measure is email engagement – so how do you get it? Two solid reasons to get people to engage with your emails. 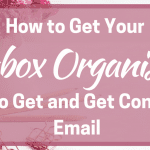 Not only do you want them to take the action you request from them in the email, but you have a better chance of them even seeing the email in the first place. Okay, on to the how! There’s a lot of talk about how ‘pretty’ emails should be and we aren’t going to deal with that too much today. I’m in the ‘plain and simple’ camp because although I like the pretty stuff, these can harm your open rates and stop mobile users seeing your stuff. However, that’s not to say you can’t bring your brand guidelines into your emails. Something as simple as using your branded fonts in the email and making sure links are in one of your brand colours can help with brand recognition. You can try using your logo in there or some other branding elements, as long as you don’t notice open rates start to drop. One of the biggest struggles I had when I started sending emails was what to say. I got the whole concept of talking to one person and trying to add value as well as a little promotion. But what should that look like? That’s where planning can come in. Most of us will have an editorial calendar of some kind that plots out what the month looks like in terms of the content we create – blog posts, social media content, video content and all that stuff. Well, it can help to plan your email content alongside it. You can also have templates for special events such as new product launches, sales and affiliate promotions. That way you are not left wondering what to write. Ever read a boring email? Probably not all the way through because when it doesn’t hold your attention, the delete button shines out to you. Off you go to the next thing, email forgotten. So how do you get email engagement and avoid being the boring email person? Consistently nurture your readers! Build a relationship, personalize the interactions (i.e. share some titbits about yourself or other relatable stories) at least a little bit, and that builds trust that leads to them being more apt to click when you ask them to. By doing this, you make the subscriber feel you are really talking to them, not just sending a blanket email to a few hundred people (which you probably are, but hey). By being a person, being interesting and telling them about stuff you are confident they want to know, you have a better chance of them opening that next email. 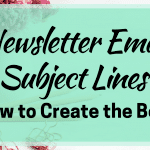 I recently wrote an article on the subject of subject lines – there’s a lot to be said about them! 69% of emails are marked as spam based on just that subject line while 35% of emails are opened just on the strength of it. But to summarise, you want to keep them short and to the point. Anything over 50 characters will be chopped off by most smartphones for starters. Create a sense of urgency or grab their curiosity. If there’s an offer inside, tell them – who doesn’t love a special deal? If you are having trouble coming up with a good subject line, check out the email subject line tester from CoSchedule. It’s free, it works a bit like their headline analyser and it gives you some great guidance. Some people argue that the first few words of the email are the most important, even more than the subject line (Neil Patel for one). I’m not going to argue with such an authority but as a desktop user, I only see one or two words so I’m not sure they play a big part! I do think that you can hook people in with those first few words in much the same way as you can with a blog post. Or at least give them a reason to keep reading, which is always the point of written content. I’ve seen some whoppers of emails over the years that look long enough to get good SEO ranking for their length. 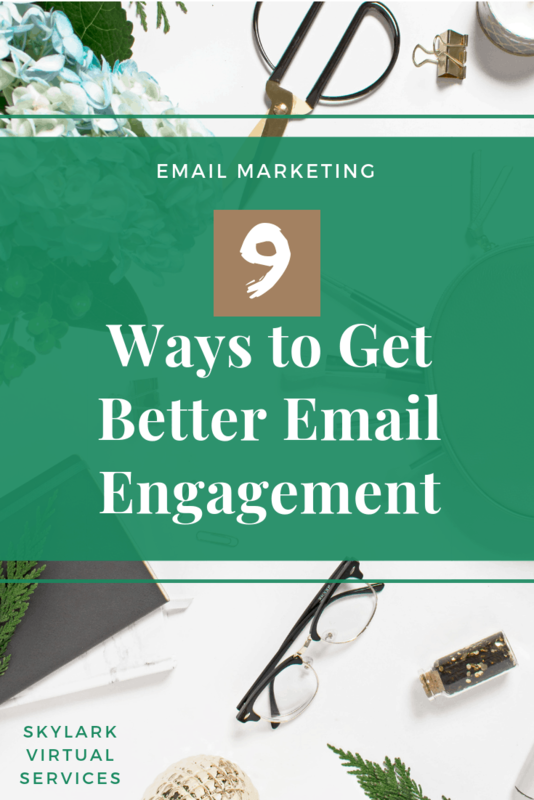 And there are times when more is good but for the majority of your emails, short and to the point is going to get you better email engagement than several chapters of a long novel. Another thing that keeping it short and simple is that it makes you be very clear about what you want the reader to do. Ask for them to click that link or hit that reply button and give their opinion! My number one tip is to ask them directly. Don’t beat around the bush, don’t kind of ask them to click. Come out and ask them to click the links and the benefit to doing so. If people are left guessing they won’t even notice that you wanted them to click the links! Adding a summary paragraph at the bottom might seem like extra work but you are capturing the skimmers. Those people (like me) who don’t always read every word but skim through and then stop at the bottom for the highlights. This is also a good place to add some emphasis to the most important things – you can even use the old ‘P.S.’ technique for this just like in letter writing days. 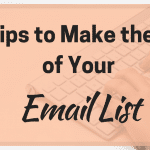 It can be tempting to make an email like a shopping list of jobs to do in the hope of getting that important email engagement. Three links, two Pins, a couple of affiliate products, a piece of curated content – in they all go in the hope that someone clicks something. And the result is often that they click nothing. Don’t confuse your readers by asking them to do 17 different things. Either you want them to post in a Facebook group OR you want them to buy something OR you want them to hit reply and tell you something — not all three. Remember when you did that planning and decided on the point of the email? Then that’s the main thing you want them to do. It might be to click the link to your new post. Or it might be to reply and give their opinion. Whatever it is, make it the clear and obvious action for them to take. The whole ‘talk to one person’ seemed a bit weird to me at first. Because I knew I wasn’t (well, I was at first but thankfully not for too long). But there is a sense to it because it is the difference between an email that is engaging and interesting and a general broadcast that could be in the newspaper. People like to feel like you know them, you are involving them in your business and that you care what they think. And as a business owner, you should and you do. So let that come through in the email! Choose one imaginary or real person and write it to them, only without their name involved. That’s a strong way to get good email engagement. 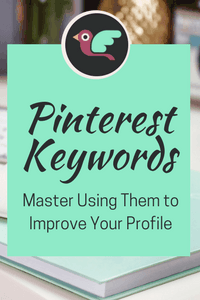 By using these tips as much as possible, you can get better responses from your subscribers. I’ve had more replies in the last three months with using this kind of approach than in the year or so before it. 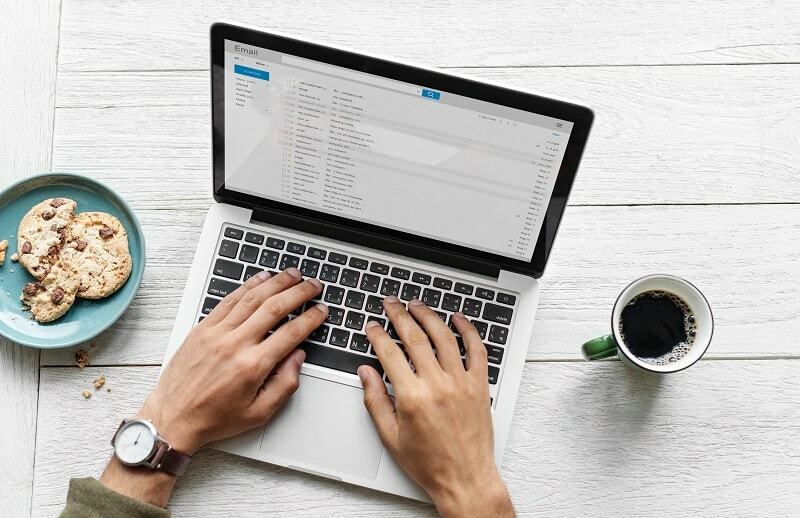 Email marketing isn’t going anywhere, and we know we need to send those email newsletters but if no-one reads them, they might be a good email, even a great one. It won’t help you! So make them engaging, interesting and personal and you will see people doing what you ask them to. What’s your email engagement secret? How do you get people to engage with your emails?